ALIEN ORB EXAMINED MY BABY GIRL -- AND THERE WAS NOTHING I COULD DO! [WeeklyUniverse.com] Kathy Porter woke up to see an alien orb hovering near her baby daughter's crib -- whereupon the horrified mom rolled over and went back to sleep! -- because a mysterious force prevented her from protecting her baby girl! That's the chilling true-life tale that this mom-turned-author told the Weekly Universe on November 23, at Loscon 34 -- Los Angeles's premiere science fiction convention. Her tale of terror occurred 17 years ago, in Los Alamitos, CA. Porter was asleep in bed, her hubby by her side, her baby daughter peaceful in her crib. Suddenly, Porter awoke to a bright light filling up the bedroom. She looked to the window, seeking the light's source. "Then I realized the light was notfrom outside," said Porter to the Universe. "This light was in my room! "The first thing I thought of was my baby! I wanted to see if she was all right. I tried to sit up..." But shockingly, Porter couldn't get up! "I noticed that my husband, who usually snores, was quiet. I thought, I should wake him up. But then I thought, no, no, no, no! I tried again... I need to wake him up... I need to protect my baby... But again I thought, I shouldn't wake him up." Torn between her conflicting impulses -- by a mother's desire to protect her loved ones and some alien compulsion to do nothing -- Porter said she "finally rolled over to see the crib." That's when she saw the horror in her bedroom. "There was an orb in my room! A foot and a half round, defying gravity!" 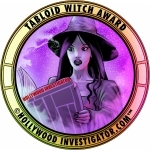 The orb was a metallic blue, and emitted a light whirring sound, and a bluish-red/whitish glow that vibrated about the orb -- until she looked at it. "As long as I'm looking at it, the light remained steady. As if it was observing me while I was observing them! "Then I heard my baby sigh, and I thought, Oh my God, is she okay? Again, I felt I should wake my husband. Instead, I rolled over and went back to sleep. I thought, I'll tell Roy in the morning. I was horrified with what I was doing. But I couldn't do anything else!" To her relief, the next morning her baby was fine. The orb was gone and has never returned. But this alien confrontation inspired Porter to write the sci-fi novel, Gray Guardians. 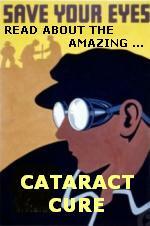 Its first chapter is based on her true-life experience, the rest is wholly fictional. A tale of seismic activities, a pandemic of SEAS (Severe Environmental Allergy Syndrome), orbs, and alien abduction. 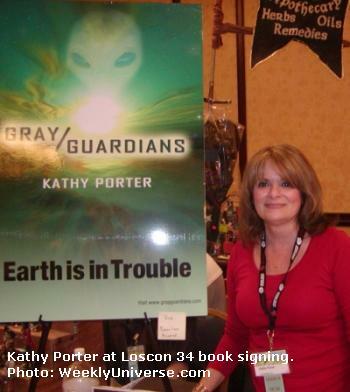 Kathy Porter's website has more info about her book, Gray Guardians.